If you're looking for a great (and cheap!) hotel in Rome, CheapTickets is the best place to find them. We offer deals on the best 3860 hotels throughout Rome. No matter what you're looking for, we have options for you. Grab great rates on the 390 affordable 3-star hotels that are easy on the wallet without sacrificing comfort. Looking for more luxury? Try one of the 332, 4-star hotel accommodations in Rome. No matter your budget needs, we've pulled out all the stops to make sure you have plenty of vacation options. Maybe you prefer to search for your hotel deals based on what each hotel offers? For example, let's say you just want to find a hotel or resort that has a pool to cool off in after a long day exploring Rome. Scroll down to choose from the 151 hotels in Rome that has a pool for guests. Or search for deals on Rome hotels offering free wifi or breakfast, non-smoking rooms, and more! CheapTickets is here to be your personal travel agent for your next trip to Rome. Get booking today! What hotels in Rome offer free wifi access? Are there deals on Rome hotels offering free breakfast? Yes! The only thing better than finding a great deal on a cheap hotel in Rome is finding one that offers free breakfast. Grab some eggs, a waffle, or some healthy oatmeal before a day full of exploring Rome and all that it has to offer. Below are just some of the many hotels that offer free breakfast in Rome. Best Western Premier Hotel Royal Santina is a 4.00 star rated hotel property in Rome that offers free breakfast. Kolbe Hotel Rome is a 4.00 star rated hotel property in Rome that offers free breakfast. Fortyseven Hotel is a 4.00 star rated hotel property in Rome that offers free breakfast. Hotel Barocco is a 4.00 star rated hotel property in Rome that offers free breakfast. What about deals on pet-friendly hotels in Rome? Rome is a great place to get outside and explore with your pets in tow so don't leave your furry friends behind. Below you'll find great deals on hotels in Rome that allow pets. Don't forget to bring plenty of treats! Valadier Hotel is a popular, pet-friendly, 4.00 star hotel in Rome. Bettoja Hotel Mediterraneo is a popular, pet-friendly, 4.00 star hotel in Rome. Hotel Barberini is a popular, pet-friendly, 4.00 star hotel in Rome. Starhotels Metropole is a popular, pet-friendly, 4.00 star hotel in Rome. Any good rates on Rome hotels with restaurants? Absolutely. Don't want to deal with planning our all your meals on your trip to Rome? We don't blame you. Keep the hangry away by staying in one of the 390 hotels that have restaurants. With a room at one of these spots, all it takes to get a good meal is hopping in the elevator. Check out some of the most popular hotels in Rome that have restaurants below. 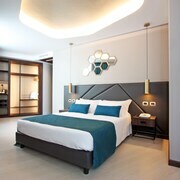 Book Exe International PalaceExe International Palace is a 4.00 star hotel and has one or more restaurant options. Book Best Western Plus Hotel UniversoBest Western Plus Hotel Universo is a 4.00 star hotel and has one or more restaurant options. 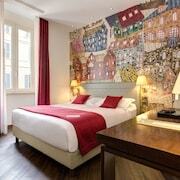 Book Hotel RexHotel Rex is a 4.00 star hotel and has one or more restaurant options. 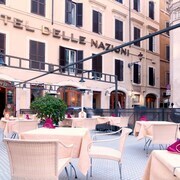 Book Hotel Delle NazioniHotel Delle Nazioni is a 4.00 star hotel and has one or more restaurant options. What are the cheapest hotels in Rome with pools? What's better after a long day exploring Rome then a relaxing dip in a pool? Finding the Rome hotel you need for a bargain! Cool off and unwind at one of our 151 Rome hotels with a pool. Browse some of the top deals on these hotels and resorts with pools in Rome below, but be warned: You may not want to check out! Hotel Cosmopolita has a pool and a 4.00 star rating. Welcome Piram Hotel has a pool and a 4.00 star rating. 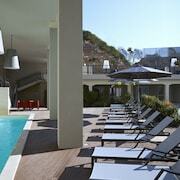 Hotel Artemide has a pool and a 4.00 star rating. Hotel Quirinale has a pool and a 4.00 star rating. What hotels in Rome offer parking for guests? Once you've made your way to Rome, the last thing you want to deal with is finding parking close to your hotel. Avoid the hassle of parking around the block and carrying your luggage all the way to the lobby by booking one of our hotels with parking. Check out deals on some of the 720 hotels in Rome that offer parking for guests. FH Grand Hotel Palatino This hotel has a 4.00-star rating. Hotel Alimandi Vaticano This hotel has a 4.00-star rating. iQ Hotel Roma This hotel has a 4.00-star rating. Aurelia Residence This hotel has a 4.00-star rating. Do Rome hotels offer 24-hour concierge services? When you're on vacation, things don't always go according to plan. Travel with peace of mind when you book one of our 793 hotels in Rome with 24-hour concierge service. That way you know help is always phone call or elevator ride away. Try Hotel Scalinata di Spagna. It's a 3.00 star rated hotel in Rome that offers concierge services 24 hours a day. Try Hotel Ponte Sisto. It's a 4.00 star rated hotel in Rome that offers concierge services 24 hours a day. Try Hotel Condotti. It's a 3.00 star rated hotel in Rome that offers concierge services 24 hours a day. Try Hotel Smeraldo. It's a 3.00 star rated hotel in Rome that offers concierge services 24 hours a day. What about low rates on non-smoking hotels in Rome? The Fifteen Keys Hotel This hotel has a 4.00-star rating. 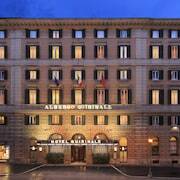 Hotel Quirinale This hotel has a 4.00-star rating. Hotel della Conciliazione This hotel has a 4.00-star rating. Al Viminale Hill Inn & Hotel This hotel has a 3.00-star rating. What are the cheapest Rome 3-star hotel deals? Our 3-star hotels bring you quality accommodations at a lower price point for the perfect, budget-friendly vacation in Rome. With 390 3-star hotels throughout Rome to choose from, you still have options. Browse our selection below. Albergo Del Senato. 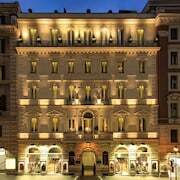 This 19th century baroque hotel stands on Rome's Piazza della Rotonda, opposite the Pantheon. The Trevi Fountain, Piazza Navona, Campo dei Fiori, the Spanish Steps, and Via del Corso are within walking distance. Hotel Condotti. 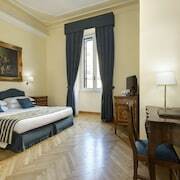 Located in Rome Historic Centre, this hotel is steps from Piazza di Spagna and Spanish Steps. Trevi Fountain and Pantheon are also within 15 minutes. Hotel Scalinata di Spagna. Located in Rome Historic Centre, this family-friendly Rome hotel is steps from Trinita dei Monti Church and Spanish Steps. Trevi Fountain and Pantheon are also within 15 minutes. Hotel Smeraldo. Located in Navona, this hotel is within a 10-minute walk of Campo de' Fiori, Piazza Navona, and Pantheon. Piazza Venezia and Vittorio Emanuele Monument are also within 10 minutes. What are the best deals on 4-Star Hotels in Rome? Rome is full of hotels and it can be hard to narrow down where you really want to stay. Luckily, we've done that hard work for you be narrowing you from 3860 hotels throughout Rome, to the 332 4-star hotels in Rome. Our 4-star hotels in Rome are exactly what you need for your next family trip, romantic weekend, or solo getaway. Check out our most popular deals below. UNA Hotel Roma: This stylish hotel is a 2-minute walk from the Termini rail station and just 0.3 km (0.2 mi) from Basilica di Santa Maria Maggiore and the Opera Theatre. The Colosseum and Forum are 1.2 km (0.8 mi) away. iQ Hotel Roma: Centrally located in Rome, this hotel faces the Teatro dell'Opera and is within 2 blocks of the Repubblica metro station and Via Nazionale and within 1 km (0.5 mi) of Basilica of Santa Maria Maggiore. Hotel Quirinale: Central Rome hotel housed in a late 19th-century building retaining much Imperial grandeur, 500 metres from Quirinale Palace and one kilometre from the Colosseum. Starhotels Michelangelo: This hotel draws business travelers and families to its doors, 2 blocks from Rome's Vatican City, Saint Peter's Basilica and Square; Vatican Museum is a half-mile away, as is Castle San Angelo. What are the best activities to do in Rome? Dine at Ambasciata d'Abruzzo Restaurant: Starting at just $52 per person. Private Excursion to the Amalfi Coast: Starting at just $96 per person. Tivoli Tour With 2 UNESCO World Heritage sites: Hadrian's Villa & Villa d'Este: Starting at just $91 per person. Rome in 1 Day: The Vatican, Colosseum & Ancient Rome: Starting at just $102 per person. The hotel staff was excellent. They went out of their ways to make us feel right at home. Specifically I'll like to mention Giulia, thank you for everything. The food was great, and we couldn't ask for a better room for the money paid. We'll definitively will return to this hotel while in Rome. Thanks. wonderful hotel, excellent, friendly staff. would definitely stay again. Short stay,but very pleasant and comfortable. Very small slow elevator, but certainly fits the antique motif.